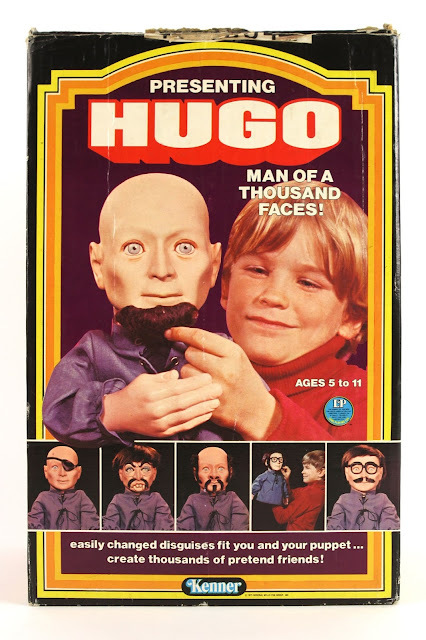 This week at Flashbak, I remembered a great (if creepy…) toy from the 1970s: Kenner’s Hugo, The Man of a Thousand Faces. “Now here’s some good old-fashioned nightmare fodder from the mid-1970s. Hugo -- the face you see before you -- is a bald-hand puppet, thirteen inches in height, with a big, bald plastic head, and cloth arms. This unforgettable toy, Hugo, the Man of a Thousand Faces, was manufactured by Kenner so that youngsters could practice the fine art of movie make-up and, I suppose, crafting sinister disguises. Created by screenwriter Alan Ormsby (1943 - ) -- also an actor and author of the book Movie Monsters -- Hugo the Man of a Thousand Faces was released in 1975, and came complete with a cloak, wig, glasses, and more. Please continue reading at Flashbak. Ormsby was also behind the make up FX for Children Shouldn't Play With Dead Things, Deathdream, and Deranged. Hugo was one of those toys from my childhood years (I was born in 1971)that I somehow missed. In fact, first time I ever saw one was in the original Pee Wee Herman Show in the early 1980s. Hugo portrayed Pee Wee's hypnotic puppet (Dr. Mondo, I think he was called?). David. Do you remember that Alan Ormsby and his then wife Anya starred in the movie "Children Shouldn't Play With Dead Things"? And also him and the guy who played Jeff in the movie with him also had small parts in Deathdream while his wife had one of the leading roles playing Andy's sister. And the actress who played Terri in CSPWDT played Andy's girlfriend. It seems as if all of these actors were very good friends in real life! Sure do. Children is a real favorite. Matter of fact I finished off watching all of the Blu Ray a month ago. They had a nice little acting troop there.